In the Allegheny Court of Common Pleas case of Stepanovich v. McGraw and State Farm Ins. Co., GD 10-16523 (C.P. Allegh. Co. July 31, 2012 O’Reilly, J. ), Judge Timothy P. O’Reilly addressed issues raised in a Motion for a New Trial following a post-Koken combined trial of the third party and the UIM claims. According to reports on this matter, the insurance company defendant was not identified at the trial. Judge O’Reilly’s Order granted a new trial to the Plaintiffs in light of the failure to identify the UIM carrier at the trial. To date, no Opinion has been issued yet. In his Order, Judge O'Reilly granted the Motion for New Trial by finding, in part, that it was a denial of due process not to identify the insurance company at a post-Koken trial. This case is going up on appeal to the Pennsylvania Superior Court. As such, an explanatory Rule 1925 Opinion is expected to be issued by the trial court to explain its ruling. The Superior Court's opinion on the issues presented will be a highly anticipated decision as being one of the first, if not the first time, that the Superior Court has squarely addressed important, recurring issues from a post-Koken cases. As the initial post-Koken cases have now proceeded through the pleadings and discovery stages and have reached trial, we may begin to see a number of decisions coming out of the appellate courts to give much-needed and desired guidance on the myriad of issues the trial courts and the bar have struggled with over the past few years. 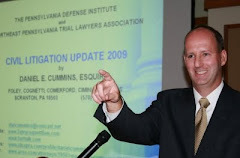 Anyone desiring a copy of the Court's Order in the Stepanovich case may contact me at dancummins@comcast.net.